My senior high school science project was a big deal. If I could do well in the competition, there was every chance it would help me get into a good engineering school, so there was a lot riding on choice of projects. It had to be something that really captured my imagination, something that could combine both, not just one, of my life’s passions. How could I choose between science and music? Ever since sophomore year, I had been fascinated by the mysteries of wave propagation of energy. I had an intuitive understanding that the secrets of the universe would be discovered by learning about the interplay of wave and particulate energy. I wanted the project to challenge me__ be something I could learn from, something that would be unique enough to capture the attention of the judges, some amazement that could demonstrate capability of intellect but also express the musical fluidity of a distinctly woman’s soul. Given all of that, only one project would do: I must build and demonstrate a Theremin. Knowing how to play such an abstruse instrument at fifteen was an odd attainment. It was something that I simply fell into, a bit of serendipity. My Dad was trying extra hard during my sophomore year, when I went to live with him and his second family, after his having been “in hiding” since I was nine. Fathers do that sometimes. They just vanish, leaving little girls to wonder why. I wished I had been a boy; then he might have stayed. But suddenly he was back in my life, albeit with step-children and a step-mother right out of Cinderella. I anticipated the worst, but Betty turned out to be a better mother than my real one, who had been a disappointment of multiple dimensions. Betty had been willing to split the family for a short time so I could get a good start for sophomore year in my new school in Connecticut. Our home was in East Northport on Long Island, but Daddy was building us a new house in Wilton, located in affluent Fairfield County. Too cool! I was delirious with happiness. After having been essentially an orphan, living on the beneficence of my mother’s sister Judy, being reunited with my father was almost too wonderful to believe. Surely something would happen to ruin everything. Daddy and I were to go on ahead and stay with a benefactor of his who lived in a Boston Post Road mansion close to my new school. She had two daughters near my age, and offered to put us up for spring semester of my sophomore year, while the new house in Wilton was completed. My favorite room at the Widow Shaw’s was the living room. It spread across the entire width of the structure, a beautiful reconstruction of an ancient barn. The room was windowed first floor to second floor ceiling on three sides with a balcony overlook opening to the second floor bedrooms. A sweeping staircase connected the upper level with the living room, its wood burning fireplace, and music area, graced by two black Steinway grand pianos. You don’t like a room like that; you love it, and you love the princely father who made it possible for a shy, gangly, near-orphaned girl-child to feel at home in such a place. I spent more time in that room than the true children who belonged there by right of ownership. I practiced my piano lessons on my favorite of the two pianos; my voice teacher giving me my weekly lesson accompanied by the same magnificent instrument. This girl-child had surely arrived. But there was something even more amazing, more mysterious, more accommodating to my imaginative fascination than even the twin pianofortes. In between them, stood a podium with Chippendale feet, black as the two keyed instruments it matched. It supported a rectangular electronic box that sprouted two radio-antennae, one vertical, one horizontal. 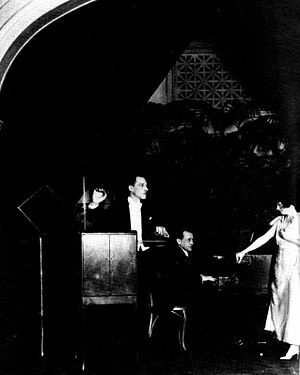 I learned to stand facing the three instruments, addressing the Theremin with upraised hands. The right hand produced melody, making texture and richness with its sensual vibration. The left was less difficult; it merely controlled the volume of the sonorous output from the right frequency-controlling vertical antenna. The only limitation to artistic expression was the ability of my mind to imagine and my hands to create and control the flow of the musical output. The Theremin could sound like just about anything analog. It could howl like a wolf, shriek like a banshee, or mimic a ghost. It could even convincingly imitate a passionate violin, viola, or cello. When the spring semester was over, and our entire family made the big move to our finally completed house, the glorious instruments had to be left behind. I saved baby-sitting money to buy an old upright to use in my room for voice and piano practice, but Betty couldn’t bear to listen to me sing opera, and she drove me out of the house to practice at a nearby reservoir. There all my annoying vocalises and operatic arpeggios would only disturb the fishes and seagulls making inland sorties. When the time came for my Senior Physics Project, my choice was a no-brainer. I would build a Theremin. Daddy had long ago explained to me how it worked; now I wanted to know how it was made. His lessons were easy to understand, just like they had always been ever since I could remember. He never told me anything I couldn’t fathom, given his uncanny knack for explaining things at precisely the level of his questioner. If he could explain it to a sixteen-year-old, I could build it. It never occurred to me to doubt the satisfactory outcome of the endeavor. He sketched an electrical diagram that made sense. No problem. I had worked the previous summer at Automatic Signal Company, a division of Eastern Industries, soldering electronic assemblies. Since I had pestered my dad to teach me to solder long before, the assembly line was a piece of cake. I would finish my station, then finish the women’s ahead of me, then finish the woman’s ahead of her. It was when I tried to complete the second station ahead of her that all Hell broke loose. I had thought all those nice ladies would be so happy that I was helping them with their work. It didn’t turn out that way though. One day the head lady lost her composure and started yelling at me. There was some problem about the bosses finding out that the work could be done a lot faster. The women knew about that, but the bosses weren’t supposed to find out. That brought to mind a comment my step-grandmother once made to me: “How can a girl as smart as you be so God-damn dumb?” I didn’t know how to answer, part of being dumb I guess. I made a formal drawing of the electrical schematic. I had watched daddy do that so many times, it was part of me. Then we made a parts list. There was an aluminum enclosure in the basement just the right size, and I placed a mail order for the four electron tubes we needed. It took a while for the tubes, sockets, and speakers to arrive. In the mean time, Daddy showed me how to pierce the enclosure with the right size holes for the tube sockets. When the parts arrived, it was easy to mount the sockets in the enclosure. We drilled the holes for the on/off switch, lights, and the antennae. I installed the switch and the power cord, making beautiful solder connections to assure solid power continuity. We bent antenna wire into the correct shapes for the volume and pitch antennae. The movement of the right hand with respect to the vertical antenna would change the capacitance of a tuned circuit that would adjust the pitch of the output. “Near” was high; “away” was low. The same system would work on the left to control output volume. “It’s easy”, Daddy assured me. “We’ll do it tonight after dinner.” I was not mollified. It looked to me like just too big a job, even with both of us working together. Dinner was served, and snappily dispatched. Daddy sauntered downstairs, picking his teeth. I was still worried, but if Daddy wasn’t, maybe I shouldn’t be either. I helped him dig out all the colors of wire we would need. He explained how the amount of electrical current that must flow through each wire determined how large, or gauge, of wire it required. Certain colors of wire were used for different parts of the circuit depending on what they were supposed to do. There was so much to learn. Too much. I felt like I should just start in and begin attaching wires, but which wires, where? Daddy seemed to be waiting for me. Then he must have realized I wasn’t sure what to do next. I had done everything I knew to do, given my understanding of the job. Daddy picked up the pliers and wire-strippers. He took a reel of black wire, snipped off a length, stripped and twisted both ends and attached one end to the on/off switch. That made sense. I looked it up on the schematic. Now where to put the other end? OK. It went to T1-4, the first tube, fourth contact. I followed along, learning as we went. I wished he would tell me where the next wire was to go and then let me solder it, but he seemed to be in a hurry all of a sudden, perhaps realizing that this was a bigger job than he had counted on. The work went smoothly with him cutting, stripping, and soldering, and me looking on and passing tools to him as required. Finally it was finished. All the lines on the drawing were represented by wires in place inside the enclosure. “Can I plug it in?” I asked. He told me to wait a bit. He found his Volt-Ohm Meter (VOM) and began to test the continuity of sections of the completed circuit. He shook his head and reaching in, cut one of the wires. The soldering iron melted the connections of that wire, and he replaced it with a longer wire that went to a different termination. More VOM checks. Another wire had to be replaced. Haste obviously had made waste. Oh my! Finally he told me to plug in the power cord, which I did. No sparks flew. He poked in and around the innards of our finished instrument and pursed his lips. In his basement shop there were hundreds of different electronic components. He began opening tiny drawers and selecting resistors, capacitors, and diodes of varying values, each identified by the bands of color encircling each tiny body. I wanted to help, but it was way, way beyond me now. As I watched him flounder about even in his electronic genius, I began to doubt him, and as it follows, to doubt myself. I should never have tried to do such a demanding project. The clock ticked. The hours went by, and I finally began to nod, my forehead thumping to the table, only to awaken and try again to stay alert and at least keep him company. Finally he told me to go upstairs and get some sleep. I protested, but he insisted. As I turned away, I glimpsed the upturned instrument. The wiring had become a tangle of components streaming out of the box, soldered into a dizzying network, each minutely adjusting the overall balance and intelligence of the circuit. It was then that I understood something basic at gut level: he knew more than I dared ever hope to know. He had so carefully kept that secret by adjusting his answers to my questions so precisely to my level of understanding. I finally headed for bed, grateful for what now was more important even than finishing my project. I was still a kid and I had to sleep, even if it meant doing it standing up. Daddy woke me early, even before my alarm. “Come look,” he said. I followed him down to the basement, and there it was. It was upright, tubes plugged in and glowing. The “on” light shone red. I turned on the phonograph, already set up to play Ravel’s, “Pavane Pour Un Enfant Mourir”. I raised my hands and began to play. The haunting melody poured a blessing over my scene of doubt and disappointment, triumph and hope. Suddenly everything was possible. Daddy had come through for me. Sure enough, It was important enough for him to stay awake all night to finish what I could not. I was all smiles and hugs, and took off for school in Betty’s car. No bus today. I needed a ride into school with all my project paraphernalia. The Theremin was a big hit at school and won the local Science Fair with me playing Ravel. Then it was time to go to Regional in Hartford. It was the Geeks turn, only in 1956 there wasn’t a name for Geek. We just didn’t get to go on dates or frequent football games, but that didn’t bother me. I never knew what the rest of them saw in following that silly pigskin around the hockey practice field. I had tried out for cheer-leading in the 8th grade, but soon learned that my arms and my legs didn’t seem to connect to the same brain. Our group loaded our gear and took off to Regional in Hartford, When we arrived we set up as instructed. The next day we hovered over our projects showing off for parents and teachers and other students who happened by. One of our guys whispered in my ear that the head judge was moving our way. I switched on Ravel and began playing the lovely melody. The coterie of judges approached and waited for me to finish the song before they began to ask questions. It was no problem answering. I knew my stuff, even if it had taken Daddy to save the day. Later that afternoon, all of us were tired and out of sorts after the tension of the competition and standing up the whole day except for noon break, when we paused to eat our sack lunches. Suddenly my High School Physics teacher came trotting up grinning. He told us that the judges had finished their meeting and that it looked like I would take the grand prize. “No!” I gasped. It hadn’t occurred to me that I might actually win Regional. I felt suddenly light-headed and must have visibly paled. “Where are they”, I asked. I took off down the hall where he pointed. The judges were coming out of the meeting room in a very good mood. There were smiles all around, back-slaps, and handshakes. Whatever it was, they were in agreement. I didn’t even hesitate, but planted myself right in front of the head judge. “I can’t win”, I told him. When he demanded to know why, I explained that my father had helped me, doing the final wiring and fine tuning of the circuitry and that I didn’t deserve to win against anyone who had been able to complete their entire project alone. It would have been unconscionable to have taken that prize, and I would have carried that shame forever. He explained that it was common for students to get help from parents or teachers when making things new to their understanding. I wasn’t to be deterred, however, and felt compelled to reject any prize at such a competitive level. He said that he was sorry I felt that way, since I had a good chance to win, even at National. I shook my head and walked away. We had started too late. I was used to Daddy letting me down, but even so, I couldn’t bear to disappoint him, which I would have done had I taken credit for his work. He promised to attend my high school graduation, where I won several science awards and scholarships, but he didn’t show up. I forgave him; we were used to disappointing each other__the tenor of our relationship. Even fifty-six years later, I am so very glad that I came clean with that judge. Knowing and accepting the truth of ourselves is all we really have. Each of us will die, but what we are of Truth will live forever. Recent studies show it is men who benefit from marriage, increasing length of life and overall happiness, while marriage limits a woman’s personal potential. Alliance with the male leverages her power, extrapolating her man’s and appropriating it as vaguely her own; at firm ground, she understands that arrangement for the fraud that it is. Cultural mores worldwide legitimize this delusion, so there is little pressure for a woman to acknowledge the insight even if she should stumble over it in a moment of unguarded clarity. In a past amicable but passionless marriage, my husband and I often agreed, “What we need is a wife!” As the distaff in that partnership, I resented always being the one to dispense caring. Why was I denied the blessings of eternal childhood while my Peter Pan husband got to fly about sprinkling pixie-dust? Everyone knows that creativity requires the freedom of play, but somebody’s got to wash the dishes. We’ll leave them for the maid, I fantasized, as we turned out the light and headed for bed and some productive cuddling. I love my kitchen, incarnation of the maternal, hub of family life, source of warmth and tantalizing odors. It is the negation of its power that I reject. A man who enters my center of female alchemy faces a challenge. Do his limbs get all gooey as he dramatizes his affected ineptitude, or does he grab a gingham apron, detailed with rick-rack and ruffles, strap it on, and start looking for a recipe for corn chowder? It takes a big man to be alive in the kitchen. Nothing is sexier than a man in an apron. His limbs get hairier. His torso takes on a more studly aspect. His confidence radiates as he personifies phallic imperative. Now the question arises: Is this about the bull loose in the china shop or about my own perceptions of manliness? This is a serious question deserving a serious response. I don’t do serious well. It’s difficult to write in a grim sterility that dismisses all vestiges of self from the product. I have spent a lifetime trying and always fail. Even the most rigidly technical effort succumbs to a pirouette of whimsy, and it’s all over. When you write poetry, write poetry; when you write prose, for Heaven’s sake write prose. I know that. I just find it hard to live up to the admonition. Some things are harder than others. (Pun intended.) Sometimes it seems I am a walking, talking, embodiment of the Freudian slip. Sigmund, his dirty old man fixation inclusive, had it right. The ladies have it figured: Manhood is wonderful. Gay or Straight, Guys are great! Can’t live with ‘em; can’t live without ‘em.